Hiking is great exercise, and you don’t have to drive outside of the city to find great trails. There are flat trails, hills, woods and water on this hike along a section of Houston’s Buffalo Bayou. We meet at the corner of Sabine Street and Allen Parkway, look for Jon in his BCO T-shirt! There should be parking along the park and street for free. 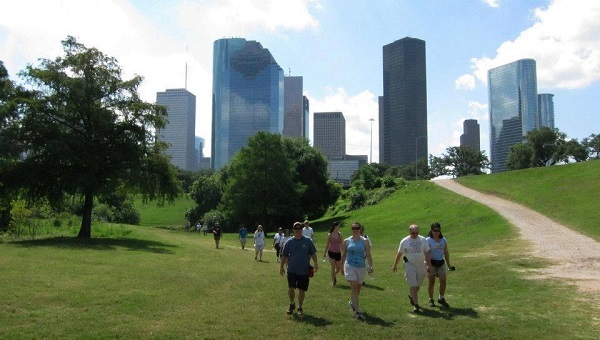 At the end of the hike you will have worked hard, made new friends and discovered all sorts of secret Houston hideaways along the Buffalo Bayou in this Bayou city! Event Summary: Hiking is great exercise, and you don’t have to drive outside of the city to find great trails. There are flat trails, hills, woods and water on this hike along a section of Houston’s Buffalo Bayou.